Just like an epic adventure movie, Batu Caves is the mystical location that seems out of place in a modernized city that is Kuala Lumpur. Ever think of putting your Nike shoes to the test? 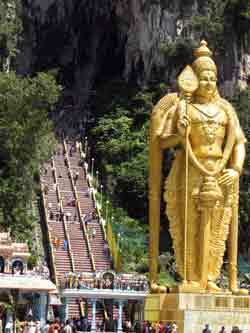 Try running up Batu Caves' 272 steep stairs to its Temple Cave. Rocky Balboa had it easy. Just kidding. 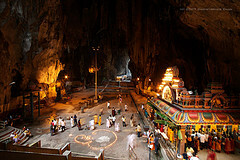 Batu Caves, also known as the Sri Subramaniar Swamy Temple, is situated approximately 13 km from the heart of Kuala Lumpur. It is believed to have gotten its name from a nearby river, the Batu River. This attraction is comprised of three caves - the Art Gallery Cave situated at the ground level, the Dark Cave which is to the left of the main cave and the Temple Cave. The cave was first discovered by an American naturalist named William Hornaday in the year 1878 but was Officially established by K. Thamboosamy Pillai in the year 1891. The rocks forming the caves are 400 million years old and have undergone compression to create the limestone cavern that you see today. It is said that it takes about 100 years for a formation to grow an inch. Phew....talk about stunted growth! Other astounding formations are beautifully coloured cascading wall of water called a flowstone, a large rimstone pool, small round formations on the floor known to some as cave pearls, magnificent columns and stunning cave curtains. Each formation is a wonder of nature, having its own unique character. 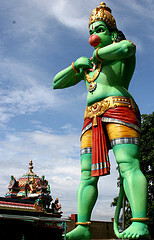 Also, it is said that in the 70s, there was a 5 legged bull which was revered by the Hindus. They decided to immortalise the bull by building a statue of it which now sits just outside the Art Gallery cave. On the way up the cave stairs, you can expect to be greeted by both the homosapien locals as well as their furry look-a-likes with a long extending tail. It is advisable to not be feeding them or that would be pretty much what you'd be doing for the rest of the trip there. Things provided at the site are Wellington boots, shower facilities, safety helmets and torchlights. 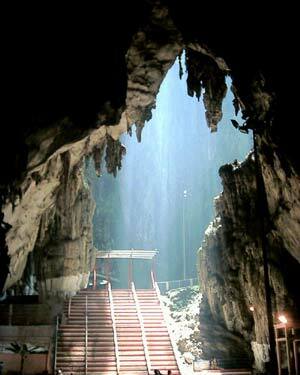 To explore the wonders of Batu Cave, kindly contact call cave wardens Suja at 019-215 5682 or Jaya at 012-310 3464. The education & adventure trip should last for about 3 hours. The fee for an adult is RM80 while children below 10 years old is RM60. A minimum of 5 pax is required for this tour. Even so, everything is negotiable. With the homosapiens at least!